LGB Regional Institute of Mental Health, Tezpur. 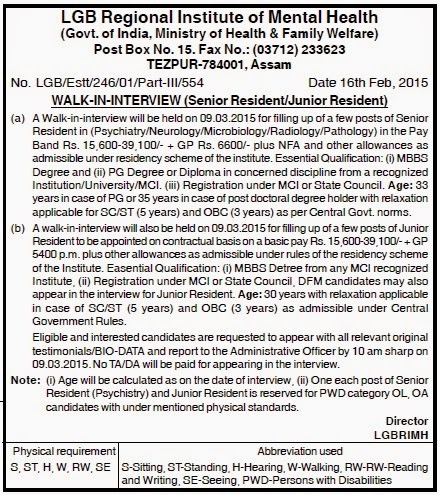 A walk in interview will be held on 09/03/2015 for filling up of a number of posts in LGB Regional Institute of Mental Health, Tezpur. Educational Qualification: MBBS Degree from any MCI recognized institute. Registration from MCI or state council. Pay: Rs 15600-Rs 39100, GP= Rs 5400/month. Educational Qualification: MBBS Degree from any MCI recognized institute. PG Degree / Diploma in concerned discipline. Registration from MCI or state council. Pay: Rs 15600-Rs 39100, GP= Rs 6600/month.